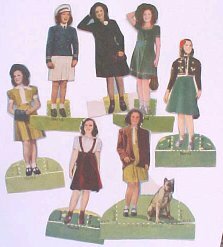 Early paper doll of Elizabeth Taylor...........long before her 1963 portrayal of "Cleopatra" with Richard Burton and Rex Harrison. 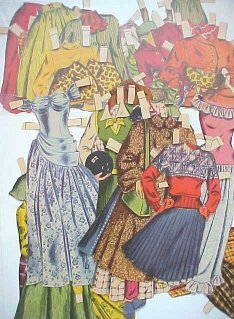 These paper dolls were published at the time she appeared with June Allyson, Margaret O'Brien, Janet Leigh and Mary Astor in "Little Women" (1949). Some of her earlier movies included "National Velvet" (1944), "Life With Father" (1947), "Father of the Bride" (1950) and "Quo Vadis" with Robert Taylor and Deborah Kerr. Check out the glamorous fashions for a glamorous star. 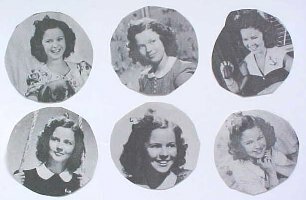 Gloria Jean was a child singing star in the early 1940s. 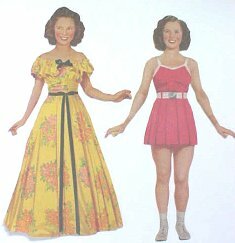 She portrayed Judy in the 1945 musical "Easy to Look At." 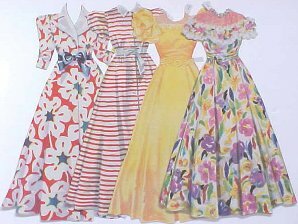 Several late 1940's musicals followed including "An Old Fashioned Girl" (1948), "I Surrender Dear" (1948) and "There's A Girl In My Heart" (1949) with Peggy Ryan. And she does have a web site! 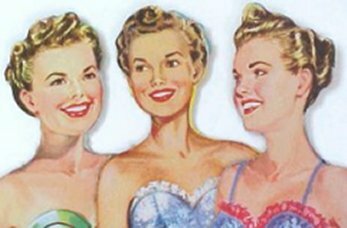 Gale Storm had a top-rated TV series from 1952 to 1955 called "My Little Margie." 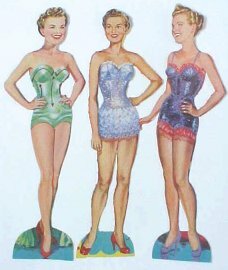 Although a noted singer, this program verified Gale Storm's talent for comedy. 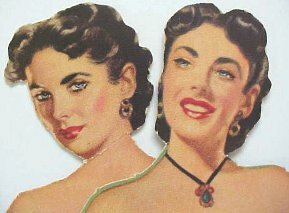 The character of Margie Albright is memorable as the funny, good-hearted daughter of Vern Albright (Charles Farrell). 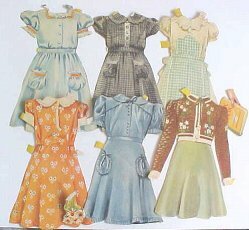 Not only is "My Little Margie" available on video........Miss Storm also has a web site of her own. 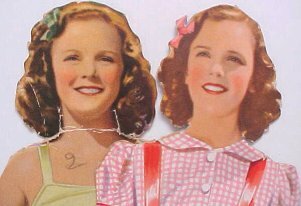 Shirley Temple as a young teen instead of the precocious child who sang "Animal Crackers In My Soup" and "On the Good Ship Lollipop." 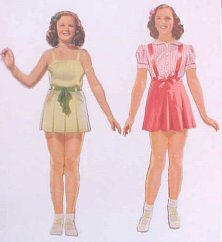 Early 1940's young adult fashions. No longer the cute child star with a puckered, pouty mouth. Shirley is now a lovely young woman. It as during these years that she co-starred in such movies as "I'll Be Seeing You" (1944) with Ginger Rogers and Joseph Cotton, the World War II drama "Since You Went Away" (1944) with Claudette Colbert, and "The Bachelor and the Bobby-Soxer" (1947) with Cary Grant and Myrna Loy.